When life gives you a 4 pound bag of lemons, you make your own Del's Lemonade!! What's a Del's Lemonade, you ask? Why, it is a soft-serve, frozen lemonade famous in Rhode Island. It's like drinking snowy lemonade (which is exactly how it was created), but NEVER with a straw - you shake it and roll it around the cup, the heat from your hand slowly melting it into the perfect drinking texture. And weather you buy it from a Del's Lemonade stand, truck, or cart - a pretzel rod or gumball stuck atop is the perfect garnish, regardless of age. So I don't have any pretzels or gumballs....and I don't have any of the iconic green, waxy cups that it's dispensed in...but I do have the sweet, tart, and frozen concoction that has all southern New Englanders swooning!! You can purchase a Del's powdered mix, blend it together with water and ice cubes, and just be done with it. But if you have lemons, sugar, water, and time - you can make it yourself - 100% o'na-tu-ral. 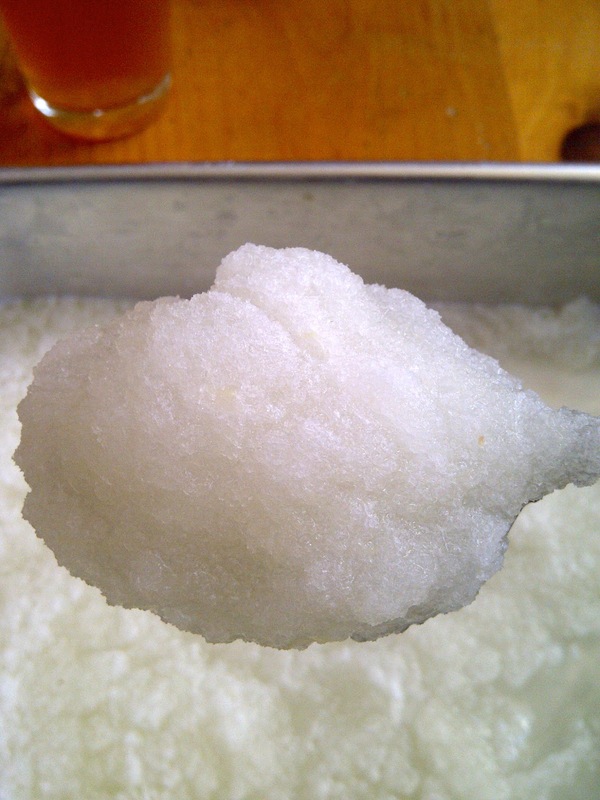 By making this yourself you can alter the amount of sugar used - sweetening it to your liking. I used 1/3 cups of sugar...less than you'd get from a Del's, but sweet enough for me. You don't need a facy ice cream maker - just a pan, a whisk and a blender.....and time....and patience.....just a lil' bit. **Caution**Warning**consuming this too fast will result in an ice cream induced headache!! I got so excited, I ate a few spoonfuls - dropped my spoon, clutched my head, and cursed ice cream headaches!! This is how it should look - smooth, and slush-like - with just a few hints of lemon zest throughout. If you can't make it to Rhode Island during the summer, here is an easy copycat for this famous treat!! Place a 9x12 baking pan in the freezer 30 minutes prior to mixing the ingredients. Dissolve the sugar in 2 cups of water - mix thoroughly - add lemon juice and zest. Pour into frozen pan, put back in the freezer for 90 minutes - stirring every half hour. This should leave you with a solid layer, yet pliable enough to break apart with a spoon. 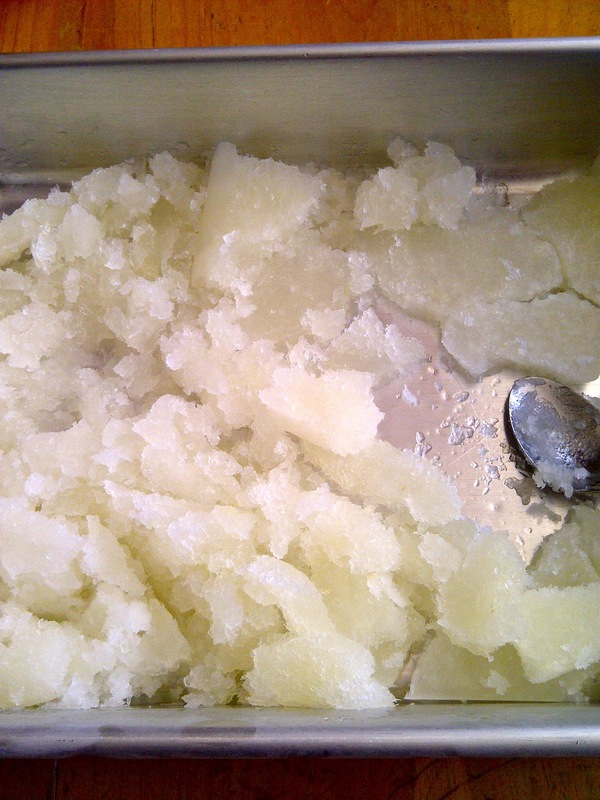 Break the lemon ice into small pieces, taste test it - if more sugar is desired it can be added here, with the final cup of water. 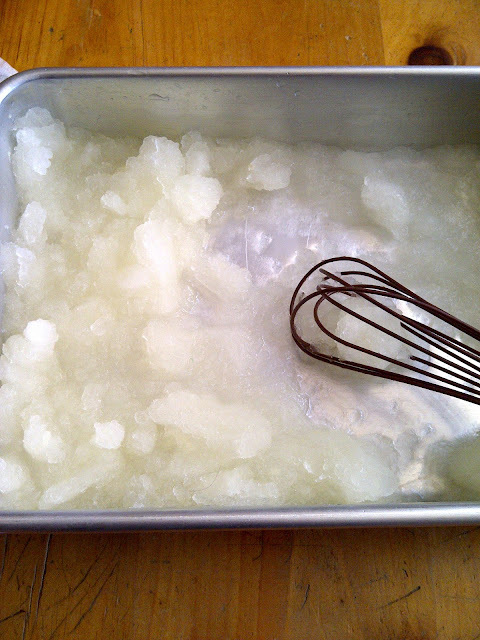 Whisk in the remaining water until ice becomes slightly melted and slushy. Immediately pour into a blender, starting on low for 20 seconds, then switching to high for 20 seconds - or until no large pieces of ice are present. Oh I love Del's Lemonade! What an awesome recipe, I can't wait to try it! Pinning now! Following you now on Bloglovin. Looking forward to seeing other fun stuff on your blog! Hope your weekend has been great! Thanks, Jen!! This was a staple for me when I lived in RI!! I've never had a Del's Lemonade so I need to try this recipe! I hate a brain freeze! Happens to me everytime I get a frappuccino. Mmmm, I love frozen lemonade. It's so great on a hot summer day. Looks so yummy and refreshing! Perfect for the upcoming heat of summer! Yes - a summer must!! I love frozen lemonade, especially with a little mint! Thanks for sharing at Fluster's Creative Muster Party! Yes! Mint would be lovely!! It use to grow wild in my yard...then we moved - it breaks my heart to pay $3-4 for it at the grocery store - but worth it every time!! It is a childhood favorite...still today!! Thanks for stopping by!! I'm not familiar with ez sweetz - but it should do the trick! This is great! My husband is from rhode island and loved del's as a kid. He will be so excited when I make it for him. Whisking in the last cup of water is what really gives it that Del's consistency....I hope he enjoys it....add a giant gumball &/or a pretzel rod...he'll know what I'm talkin' bout!! I'm stopping by from Thursday's Treasury. This recipe looks awesome. I always love slushy lemonade but I've never tried making it myself. Thanks for sharing - I'm going to pin this. 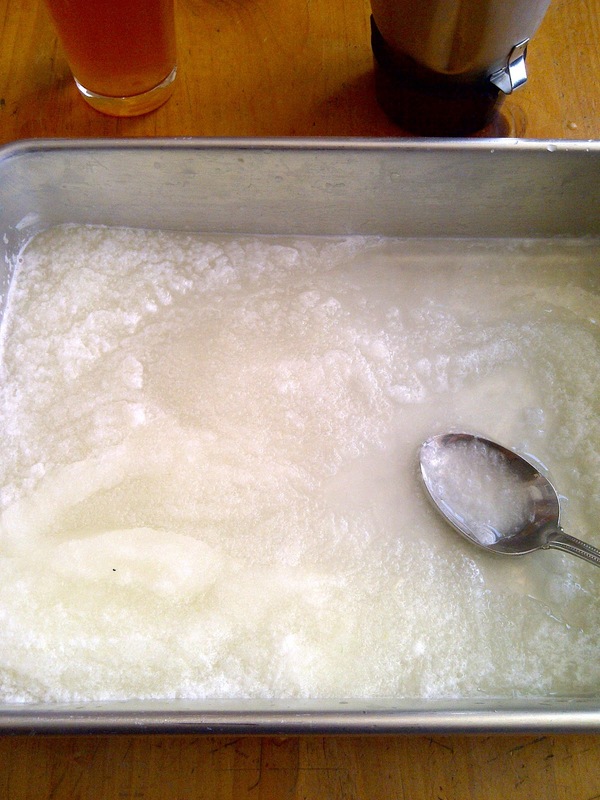 Hi Kim, I clicked over from the Foodie Friday link up at Home Maid Simple. These look so good and sound perfect for the long, hot, desert summer that's quickly approaching here in Arizona. 115° might actually be tolerable with a frozen lemonade! Thanks for sharing. 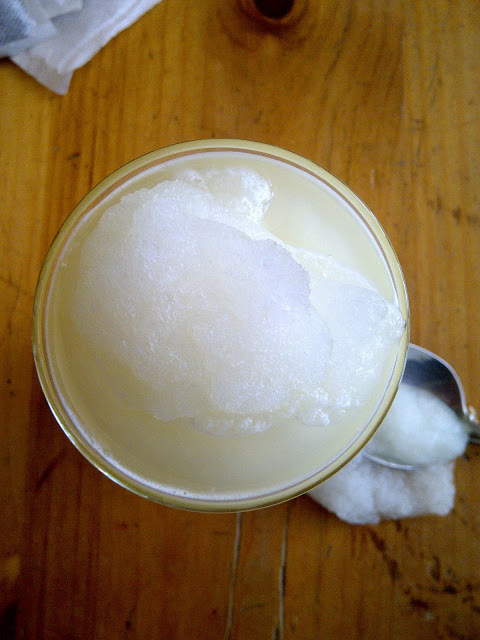 Oh heavens--I'm *obssessed* with frozen lemonade--Thank you for this!!!! :D :D I will have to try this very soon! They're like liquid crack during the summer months, I swear! KIM!!!! You're killing me here with these wonderful Rhode Island treats you post - I'm SO homesick for these foods!! LOL!! We've seen Del's served out here in AZ, but it doesn't taste the same and get this, they serve it with a STRAW!!! Can you believe that?!?!?! haha SO sacrilegious! Ha! I guess I am homesick or them, as well! OMG - NEVER WITH A STRAW!!! That's not the Rho' Disland way! Flashback I think I remember drinking one of these when visiting my cousins in RI. It had a red gum ball in it! Cool, thanks for bringing this by foodie friday. Oh, wow! 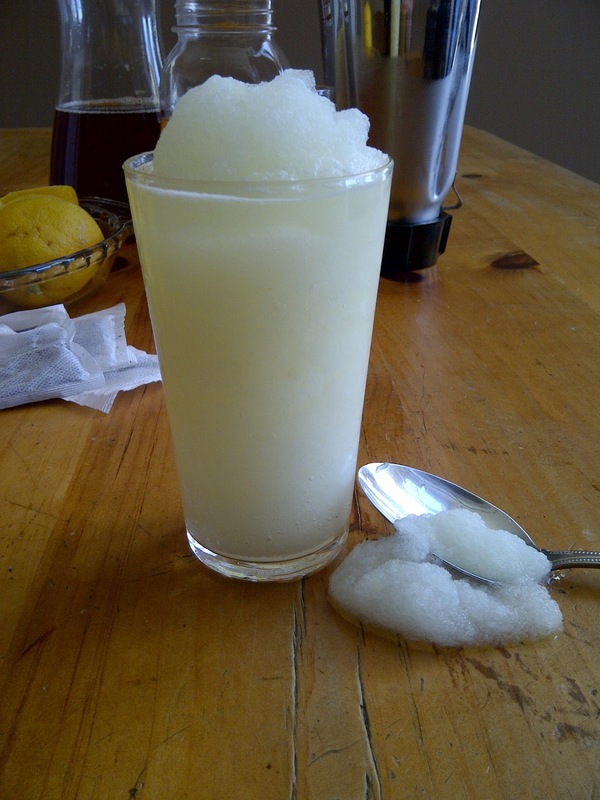 What a cool way to make frozen lemonade without special equipment! I cannot wait to do this during the summer. Visiting from Sweet & Savory Sunday! All you need is a whisk ;) no fancy-shmancy electro gizmos!! Hope you enjoy them. Nothing better than a Del's from Misquamicut on a July day. One of the best tastes of my youth. I can still remember the taste even though I haven't had one in a decade. This summer for sure. Thanks for the recipe! Found from The Better Half. :o) You gotta try it - we're odsessed with it!! looks so yummy, kim. The kids would love it! Oh, yummy!! This looks so delicious. Thank you so much for sharing at A Bouquet of Talent this week. I am featuring you later today at Pick of the Bunch! Have a wonderful weekend. My mouth is watering! This looks so refreshing! Thanks for sharing at Sweet & Savory Saturdays #13. Thanks so much for the feature!! It is truly a must-have for us!! How perfect is this for summer! Thanks for sharing and coming back to All Things Pretty! Pinned it! Thanks Kathy - I'll see you this week too!